The exteriors of our homes are often seen as a place of constraint, where many strive not to appear as an eyesore or go against the grain too much in order to fit in to some degree with the neighbors. Personally, I couldn’t imagine willingly moving into developments where, even if not everything is beige, there is no visual spice to life. This post features home exteriors that went way out of the cookie cutter mold to present the bold tastes of their owners. Architecture on the coast of Greece is often seen as bright white, but there are many encounters where chroma rules. Photographer Marie Therese Magnan captured these exteriors in Symi island, Dodecanese, Greece. The key pattern on this home is almost vibrating off the wall by the choice of complementary colors. In the other photos show nice examples of white being used in just the right dose, acting as a buffer between the blue and yellow. San Fransisco nurtures a relaxed lifestyle that naturally extends into home design. The prevalent eclectic architecture in SF is just begging for bold color. In a place like SF, you won’t be shocking any neighbors for opting a bright hue for your exterior and pairing it with a vividly contrasting trim color. Wrabness, near the Essex coast in the UK is home to this fabulously eccentric vacation home based on a fictional character. The large home, completed in contemporary style holds onto English Baroque characteristics. The project was commissioned by Living Architecture, in collaboration with FAT Architecture and Grayson Perry. To read more about this project and view its interior, check out the article on Slate’s design blog. 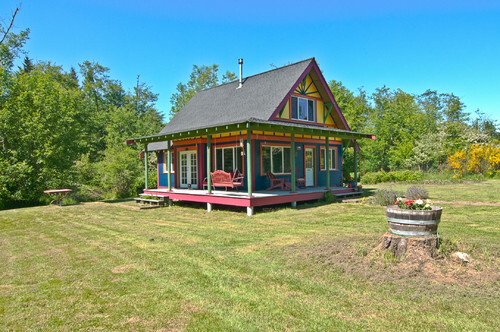 Tucked away in Washington’s Vashon Island is a whimsical home warmly regarded as the “Salsa House”. The home’s festive colors are not its only charm, much of the material used is recycled or refurbished. These homeowners threw conventional rules for pairing exterior home colors out the window and created something, that like it’s name, is zesty. The Salsa House’s color scheme just works and communicates its dweller’s style effectively. Artist Kat O’ Sullivan’s home in upstate New York has been her ongoing project. 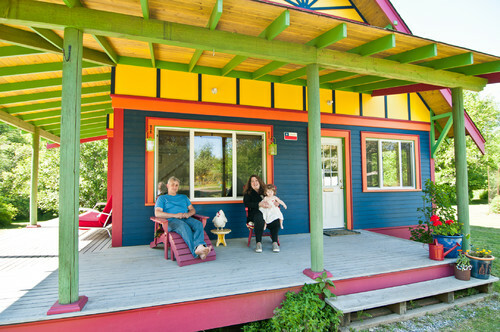 The exterior of this home captures her authentically in a psychedelic style. Although this is a church in Washington DC, I would like to share it as an inspirational work from graffiti artist HENSE. He took the commission to turn this dilapidated, abandoned baptist church and turn it into an eye catching work of art. The southwest area of DC where this church sits is thought by HENSE to have potential as an arts district. In a similar way, Tony Goldman saw a run down industrial area in Miami and thought it had potential; these days Wynwood is a thriving art hub.